Have you ever battled with circular failure surface definition using the traditional concept of an abstract point in space? And then tried to relate that surface to the slope surface? The old way is just that - again, GALENA introduced a better way! Circular Failure Surface definition using circle centres can be a thing of the past with GALENA's unique approach of definition in terms of the actual slope rather than an abstract point in space. With GALENA you can define circular failure surfaces simply, by defining their X co-ordinate intersection points with the slope surface (X-Left & X-Right), together with a nominal or desired Radius, and leave the hard work to GALENA. GALENA can of course still use the more traditional definitions; you can even combine the more traditional definitions with those provided by GALENA’s innovative and leading approach. Definition of non-circular failure surfaces is either with GALENA's CAD-style mouse line-draw function, by keyboard co-ordinate entry, or a combination of both - you can even create a non-circular failure surface from a circular failure surface in a few easy steps. Definition made easy - the way it should be! Tension cracks can be used within GALENA, and can be either manually defined, or can be of a specified depth for GALENA to automatically generate on-the-run for inclusion in all analyses... a particularly useful feature for multiple analyses. The image below shows a simple slope of a firm clay overlaying dipping bedrock. The material profiles are defined by two-point polylines - the upper profile defining the clay is horizontal and above the slope, with another defining the upper surface of the bedrock. A circular failure surface is initially defined, by its X-Left and X-Right intersects with the slope surface. In most cases a nominal Radius is also defined, particularly when multiple analyses are to be undertaken. Positioning with X-Left, X-Right and Radius is quick and easy - X-Left and X-Right can be positioned with the click of the mouse, and Radius by simply rolling the mouse wheel - it is that easy! For this particular situation the failure surface is defined primarily considering its likely position within the Firm Clay. 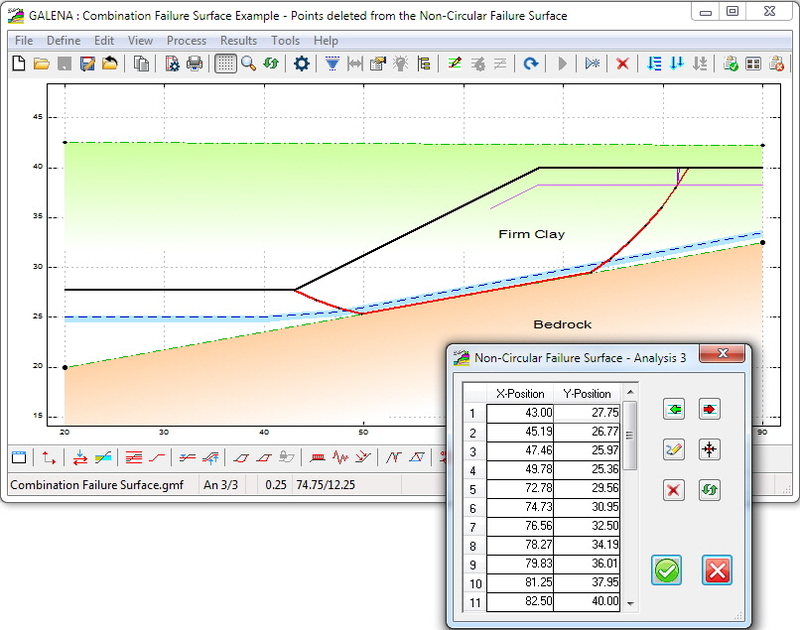 Once the failure surface is positioned as described above, GALENA allows it to be converted to a non-circular failure surface simply by selecting the non-circular failure surface option. 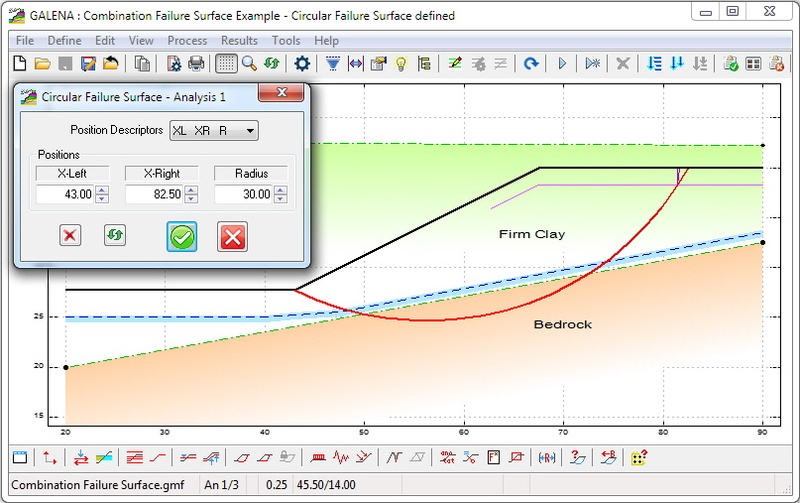 The failure surface points that are within the Bedrock can be deleted (at a click of the mouse button) to create a combination failure surface, as shown in the image below - the failure surface within the body of the Firm Clay is still circular in shape, and the section adjacent and parallel to the Bedrock is planar - this combination shape would most likely be one worthy of consideration, given the position of the groundwater (defined by the phreatic surface, and displayed as a blue dashed line with a blue colourbar). The image below shows a homogeneous slope and a non-circular failure surface defined by three points for a simple 2-wedge analysis. 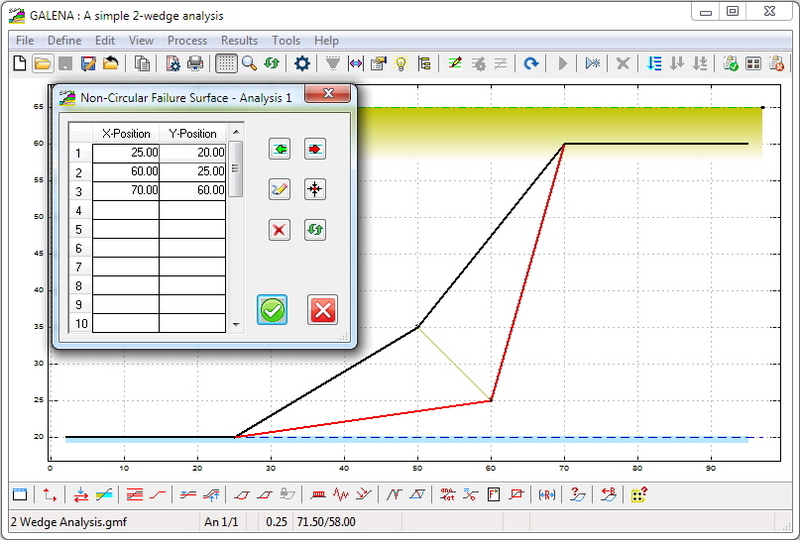 The non-circular failure surface has been defined using GALENA’s mouse line-draw function, which includes the ability to snap to slope surface points - the only point a user would need to position accurately would be the point of inflection. The image also shows the Sarma slice boundary (as a ochre solid line) defined to delineate the two wedges.